Midnight struck, and all change for National Theatre Wales (NTW). 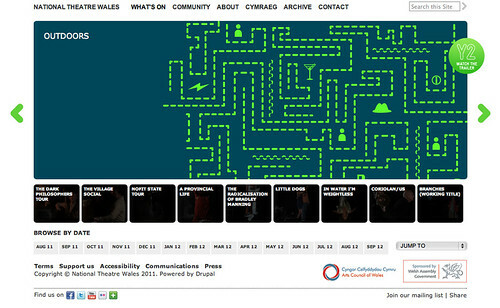 The year two program was launched and with it a change in this years approach to the NTW website. This year there was a shift from that of a journey around Wales to more of an adventure or party. Indeed the homepage is ment to capture the idea of a surreal party that has elements of all the productions/elements of NTW throughout the second year. The image was created/directed by the guys at elfen and photographed by Phil Borman. For us the homepage functions in a similar way to last years however with fewer streams coming in from the community site. The What's On pages however were the real investment in time for the revised website. It was clear that there was a need this year to develop the site to be able to cope with more than one thing going on at a time. Unlike the first year where it was basically a new event per month. The second year has a number of occasions where there are two or even three things going on at once, and unlike last year these events are not all in Wales. From these three profiles it was clear that the users would want different ways to navigate and search the information. While the information is quite minimal at the moment the search will allow in the future to gain access to a rich stream of information that it is hoped will also provide experience and recommendations. It is still very keen on content but as the content grows for the site we hope the experience will and other new elements will be added when necessary.